macOS Sierra offers you all of the features you need to make the most of Mail. 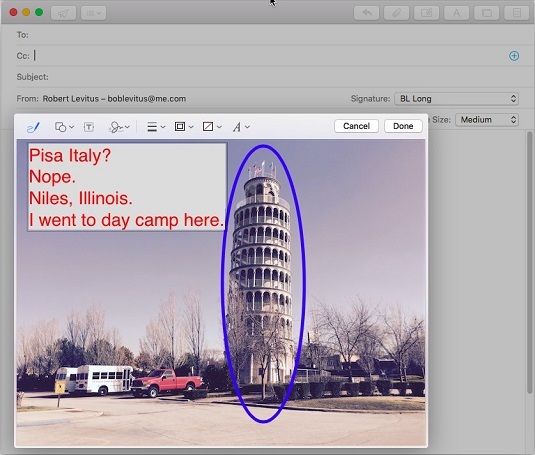 Here are two features introduced with Yosemite that bear looking into: Markup and Mail Drop. 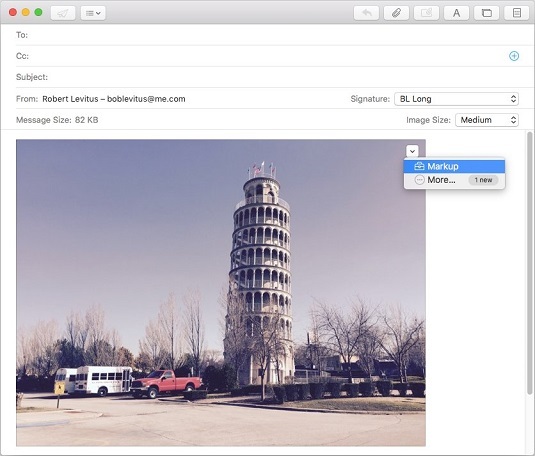 Markup lets you annotate images or PDF documents. When you’re composing a message that has an image or PDF you’ve attached or dragged in, hover the pointer over the picture and a little chevron V appears in its upper-right corner. Click it and choose Markup. Open the image in the Markup editor. The image opens in a window in front of the message. The Markup editor and some markup (the text and circle). The tools at the top of the Markup editor are, from left to right: freehand pen, shapes, text, line thickness, line color, fill color, and text formatting. Click the one you want to use and draw or type your annotations. When you’re done, click Done. Note that your annotations are saved in a copy of the image, not the original. Markup could be as a solution looking for a problem to solve. If you want to annotate an image or PDF, you can always fire up Preview and use its annotation tools. The Markup editor is some weird kind of window that has no scroll bars and no way to resize it. Try it — you can move the whole window around, but that’s about it. Worse, there’s no way to zoom in or out. Preview, on the other hand, has the same tool set and much more, in a resizable window with zoom in and out commands at your fingertips. Mail Drop, on the other hand, is an elegant solution for large email attachments. If you enclose files or a folder full of files in a message and Mail thinks the enclosure(s) might be too big to send via email, an alert appears when you try to send the message. If you opt for Try Sending In Email, Mail will go ahead and try to send your message even though it has a total file size of 86MB. Chances are pretty good, though, that the mail server you send the message through will bounce it back to you for being too large. But if you choose Use Mail Drop, which uses iCloud, your message weight can be larger, and the message won’t bounce. If you go this route, the recipient will receive a link to download the files from iCloud. Mail Drop should be enabled by default. If it’s not, choose Mail → Preferences and click the Accounts icon at the top of the window. Then click the Advanced tab and enable the Send Large Attachments Mail Drop check box.